The Academy Museum of Motion Pictures is a future museum in Los Angeles, California, currently under construction by the Academy of Motion Picture Arts and Sciences. Set to open in 2019, the Academy Museum will be the nation's first large-scale museum entirely dedicated to the art, science, craft, business, and history of film. The permanent and rotating exhibits will provide an immersive experience for visitors to explore the cultural and creative contributions that Hollywood and the film industry have made around the world. The Museum will be established in the historic May Company building—renamed the Saban Building following a $50 million gift from Cheryl and Haim Saban—located on the corner of Wilshire and Fairfax along Los Angeles' Museum Mile. The 300,000 square-foot facility is being designed by the Pritzker Prize-winning architect Renzo Piano with Renzo Piano Building Workshop and Gensler. The project is currently led by Kerry Brougher, Director of the Academy Museum, with NBCUniversal's Vice Chairman Ron Meyer as head of the Academy Museum's Board of Trustees. Pritzker-prize winning Renzo Piano designed two buildings for the 300,000 square-foot campus: the Saban Building (the former May Company building, a historical LA landmark) and The Sphere – a spherical structure featuring the 1,000-seat state-of-the-art David Geffen Theater and the Dolby Terrace, offering a panoramic view of the Hollywood Hills, including the iconic Hollywood sign. The combined building space will include 50,000 square feet of galleries, two theaters, cutting edge project spaces, an outdoor piazza, a rooftop terrace with sweeping views of the Hollywood Hills, an active education studio, special event spaces, a restaurant, and store. Located in The Sphere building of the Museum, the 1,000-seat David Geffen Theater will represent the relationship between art and technology. The theater’s programming will include presentations illuminating the art of filmmaking, film premieres from new and established filmmakers, and other high-profile events. The 288-seat Ted Mann Theater will provide a more intimate space for visitors and will offer special programs and screenings. Since the 1930s, the Academy has been collecting movie-related materials and is now considered the world's prominent curator of cinema history. The Academy's permanent collection of over 12 million photographs, 190,000 video assets, 80,000 screenplays, 61,000 posters and over 104,000 pieces of production art will influence the Museum's future exhibitions. Formed in December 2017, the Board of Trustees serves as the main governing body of the Museum and is responsible for overseeing the Museum’s overall strategic vision. The Board comprises 12 film-industry professionals with the intention to add more Trustees in the future. Currently, the Trustees include: NBCUniversal Vice Chairman Ron Meyer (Chair), Academy of Motion Picture Arts and Sciences President John Bailey, Blumhouse Productions founder Jason Blum (Treasurer), Paramount Pictures Chairman and CEO Jim Gianopulos, five-time Oscar nominated actor Tom Hanks, Academy of Motion Picture Arts and Sciences CEO Dawn Hudson, LucasFilm President Kathleen Kennedy, Cinepolis CEO Alejandro Ramirez Magaña, Netflix CCO Ted Sarandos (Vice-Chair), K Period Media founder Kimberly Steward, world-renowned fashion designer Diane von Fürstenberg, and Dolby Laboratories President and CEO Kevin Yeaman. ^ "What Academy Museum Means For LA". 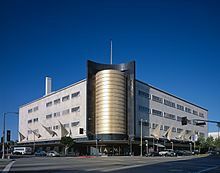 ^ "Academy Museum of Motion Pictures". ^ "LACMA sees the big picture as Academy Museum moves in next door". ^ "David Geffen Foundation Donates $25M To Academy Museum of Motion Pictures: New Theatre To Be Named For Him". ^ "Academy Museum Raises $5M From 3 Gifts". ^ "Academy Museum Sets Board of Trustees Under Ron Meyer". This page was last edited on 18 February 2019, at 22:45 (UTC).